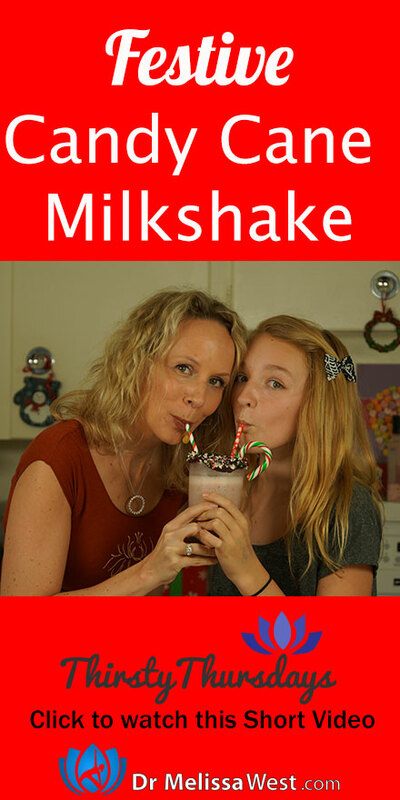 The first thing we are going to do is create a chocolate and candy cane rim for our milk shakes. Melt your chocolate chips on low heat and make sure it doesn’t burn. Then rim your glasses with the melted chocolate and cover the chocolate with candy cane. You are going to do this the same way you would rim a margarita or a bloody mary. Then put them in the freezer for 5-10 minutes so the chocolate can harden and not run down your glass. 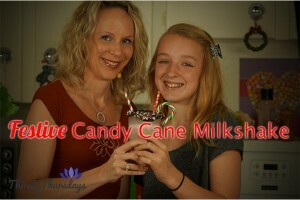 For the candy cane milkshake Trinity and I got some mint chip coconut milk ice cream. Depending on the availability at your local grocery store or health food store you could use a dairy free vanilla ice cream as well. Combine the ice cream, milk and peppermint extract in your blender and blend until smooth. If you have a blendtec you can use the milkshake setting. Add the crushed candy canes and chocolate chips and blend for another 5 secs.